As one critic remarked, Starship Troopers is a smart movie that pretends to be dumb. It takes the controversial Heinlein novel - you know the one in which Heinlein re-staged World War II in outer space with the fascists as the heroes this time around - and doesn't take it seriously for a moment. After all, how can one honestly take Heinlein's future society in which one has to do military service before attaining the vote seriously? If you are a fan of the novel, then you'd probably be horrified by what director Paul Verhoeven (Robocop, Total Recall) did with Starship Troopers. Not merely the liberties he took with the basic storyline (yeah, the novel's famous jump suits doesn't feature at all in the movie), but also the sly commentary he keeps on making about the material at hand. If you haven't read the book, but take the movie seriously as well, then, oh well, I suppose that you've missed the point then. "Melrose Place teenagers dressed up as Gestapo officers!" But how can you take a bunch of Aryan Melrose Place beautiful teenager types dressed up as storm troopers and Gestapo officers and sent off to outer space to hunt big bugs serious? The film is also in on the joke and while the first half is weak and slow moving, it is enlivened by small Internet-like infomercials - much like the occasional newscasts in Robocop. The second half in which all kinds of battles with the bugs take place is better since it is here where Verhoeven's strengths lie: staging wild, over-the-top energetic ultraviolence. Soldiers' heads and limbs get lopped off, they are burned alive, their brains sucked out and so forth. But there is a certain Doom computer game-like quality to these scenes. Sure, some scenes in the movie are as dumb as they get. (Surely there has to be better way to go about fighting these insects than using underpowered machine guns? Why still use such machine guns when you've already achieved interstellar flight?) But that's just part of the fun. Ultimately Starship Troopers deserved a bigger audience than it got upon its release in the States. But watch this film: it is destined to be a sci-fi cult favourite . 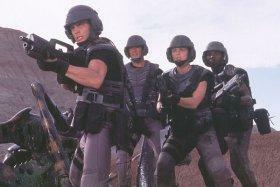 . .
Read an extended review of Starship Troopers. Read a review of Starship Troopers (Special Edition) Region 2 DVD.